It was conveyed that he would not have a free rein in making bureaucratic postings. Sunil Bansal, handpicked by BJP president Amit Shah to execute his UP blueprint, has made it clear the party’s writ would run over the government. But Adityanath has institutionalised a system to keep Bansal out, reports Radhika Ramaseshan. Yogi Adityanath -- who completes his first year as the Uttar Pradesh Chief Minister on March 19 -- has spent the last 12 months sizing up his potential challengers, consolidating and expanding his turf, balancing Hindutva and caste interests, homing in on governance, and scouring the state’s polarised bureaucracy and police to build a team of loyalists to administer through them. Adityanath's spokespersons showcased an event and a policy measure as the 'stellar achievements' of his first year in the office. Between them, the ‘achievements’ encompass the space-straddling ‘development’ and 'hard-as-nails governance'. The recent investors' jamboree had the government and the Bharatiya Janata Party over the moon. The chief minister often highlights that memoranda of understanding worth Rs 4.28 trillion -- equalling his budget for 2018-19 -- were signed. "Uttar Pradesh is coming out of the BIMARU (an acronym of Bihar, Madhya Pradesh, Rajasthan and UP, denoting sickness) condition,” said state BJP spokesperson Chandra Mohan. "Everyone, from India’s top-drawer industrialists to foreign investors, reposed faith in the state,” said Sidharth Nath Singh, health minister and government spokesperson. Another ‘achievement’ was the crackdown on ‘copying mafia’. In 1991, the BJP had enacted an anti-copying law, but it became a key reason for the party being voted out of power in 1993 because Uttar Pradesh cannot stomach a policy that challenges the status quo. "Circumstances have changed. Most youths today aspire to become someone on their own merit and not by cheating,” a minister said. Adityanath's greatest help has been the Centre’s handholding and largesse. The next Lok Sabha election is approaching, and the BJP must retain most, if not all, of the 71 (out of 80) seats it won in 2014. Besides, Prime Minister Narendra Modi is an MP from Varanasi. Shrikant Sharma, the power minister, acknowledged 90 per cent of the cost of the vaulting Sahaj Bijli Har Ghar Yojana or Saubhagya scheme was underwritten by the Centre. Launched in December 2017, Saubhagya aims at providing free electricity connections to 1.57 million rural and 302,000 urban households below the poverty line by December 2018. "The advantage of a BJP government at the Centre is it ensures a double-engine growth for the state," said Sharma. The Centre has also helped the Adityanath government in the agriculture sector. The strength of workforce in the state is 23.7 per cent, out of which 65.9 per cent are farmers and 5.6 per cent are industrial workers, according to official figures. The farm loan waiver cost the exchequer Rs 363.59 billion but has not deterred the government from continuing with as well as scaling up the development programmes. The state had a debt of Rs 3.75 trillion in March 2017, up from the Rs 2.25 trillion in 2012-13. But the Centre is playing Santa Claus -- grants for Uttar Pradesh escalated by 39 per cent to Rs 680.52 billion for 2017-18; for most others it was around 5 per cent. Surya Pratap Shahi, the agriculture minister, said, "The prime minister’s directive is do not be afraid, make the targets ambitious." The Centre’s solicitous attention, however, has limited Adityanath's carte blanche. He was hemmed in by deputy CM Keshav Prasad Maurya, who is reportedly slow in implementing orders passed by Adityanath regarding public works, food processing and public enterprises (portfolios that Maurya holds). On the other hand, Sunil Bansal, the BJP’s state general secretary (organisation) handpicked by party president Amit Shah to execute his Uttar Pradesh’s blueprint, has made it clear the party’s writ would run over the government, especially regarding transfers and postings. "Adityanath has institutionalised a system to keep Bansal out. Transfers and postings are routed through the chief secretary, the appointments secretary and the concerned department,” a government source said. Unlike his predecessors, Adityanath is yet to put in place his secretariat of apparatchiks. 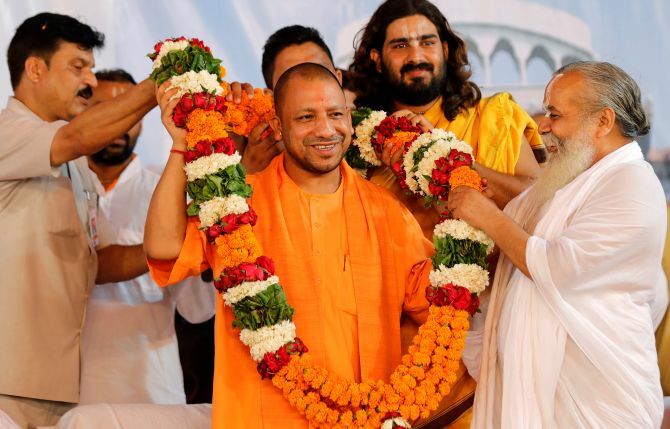 The Rashtriya Swayamsevak Sangh has nominated a ‘swayamsevak’, Abhishek Kaushik, in Adityanath’s office and the CM works through two aides from the Gorakhpeeth, R B S Rawat and Balu Rai. But he is fumbling on the treacherous bureaucratic terrain. Defence industrial corridor in Bundelkhand that projects 250,000 jobs. 'One district, one product' scheme to promote traditional craft and small and medium industries. Airports at Jewar and Kushinagar. Interlinking of Ken and Betwa to irrigate parched Bundelkhand and develop region as industrial hub. Expressway connecting Bundelkhand and Poorvanchal to Delhi. Dues of around Rs 25 billion from 32 sugar mills still to be paid to cane growers. Farm loan waivers of Rs 73.71 billion were processed in first phase but only 11 per cent of farmers received maximum benefit of Rs 100,000 under the scheme. 13.7 million rural households yet to be electrified.